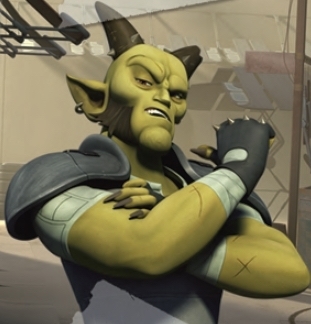 First image of Star Wars Rebels’ Cikatro Vizago! Without giving too much away: Cikatro Vizago is the name of a Devaronian criminal boss who operates on Lothal. This adds up with the rumors we have heard that Vizago is the guy you go to, good or evil if you need information. The only problem? The information could always be a double-cross! I have a feeling we might see a lot of his character over the first season, but that’s just a guess. “cikatro” the Spanish word “cicatriz” (scar) is similar and “Vizago” as the French word “visage” (face) sounds. So his name is Scar Face? Pretty cool stuff! Thanks to Jedi-Bibliothek for sharing!